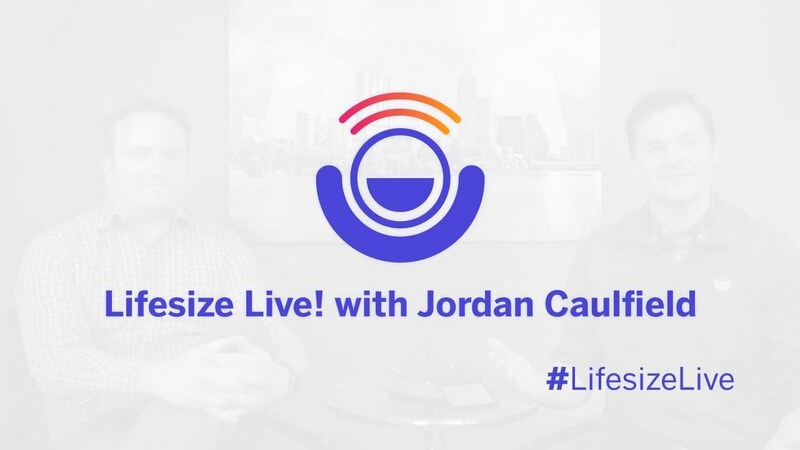 I'm your host Julian Fields, and with me today is Jordan Caulfield, Enterprise Account Executive here at Lifesize. We're talking about the new art of closing the deal and some of the best practices for using technology to help with your communications. Great to be here, Julian. Thanks so much for having me. I think it's really exciting to talk about using video to do sales and whatnot. The old way of doing things was a little bit trying, I have to say, and I'd imagine that something a lot of our current customers still do is booking travel to just basically attend a sales meeting. That initial meeting, right? Yeah, sounds hilarious to me to think about it now. Yeah, absolutely. I think having an initial meeting over video is probably a smarter way to figure out whether it makes sense to take that next meeting. There's a lot that goes into making a travel plan to go to a specific city and have meetings. It doesn't make sense to just have one, right? You want to book several to make it worth your time, and you probably want to plan multiple days. To make the best use of your time, you should set up maybe three of four physical meetings, which is about the peak number of meetings you can have in a day. Okay, so you've got eight hours for four meetings. That’s right, so most people don't really want to meet around 8:00 a.m. in person. In fact, most people don't even want to meet in person at all. There's a lot that goes into that — they have to dress differently, they have to prepare their office for your visit and everything and then they have to entertain you when you come. I would say 9:00 a.m. is probably your first opportunity to have a meeting in another city. You have to be there the day before, book hotel travel and everything to get there. And if you’re in bigger city where you have to travel across the city to get to your next meeting, 10:00 a.m. is too tight of a time frame. So, 11:00 a.m. is your spot, right? Well, it’s a little bit tricky to do that cause it butts right up against a lunch meeting, which is for your key customer you want to meet with. Then, what do you have — 2:00 p.m. for the next meeting? If you get back from lunch in time, I guess. That's right, who knows? Lunch could go long, and you'd have to cut it short anyways. So, we're looking at 9:00 a.m., maybe lunchtime, maybe a 2:00 p.m. if you get back in time, so that's 3:00 p.m., and maybe a happy hour meeting turns into a dinner. Next thing you know, it's 9:00 p.m., you haven't followed up with the people from the 9:00 a.m. meeting, and you’ve forgotten what you needed to come back with. In that travel from one place to the next, you haven't been able to answer any of the other inquiries that you've needed to answer from all your meetings. Sounds like a dead day. But this technology exists that allows you to actually have these initial meetings and conversations with people using high quality video communication tools where you can have those real high-quality discussions. You can do qualification; you can determine how much time you want to invest in some of these topics. Right, that seems like the key because not all leads are going to be the same, and if you're treating them all with going out to lunch and dinner, you're going to waste a lot of days. At one point, Lifesize was selling large, $100,000 non-scalable enterprise video conferencing solutions. They were on-premise, and they were great. It was the best stuff of the time, but now with a highly scalable cloud solution, it makes more sense to have those initial conversations over video, leveraging that technology before you go all in on the lobster dinner and whatnot. I've been using some tools that I find to be very effective. One is a little scheduling tool called FreeBusy, and basically it's just this thing that syncs up with your calendar. It's free, you send it out to whoever you like, and they can just basically get visibility to your calendar. That’s a lot better than saying “Email me four times that work for you,” and then by the time you get a response, you've already scheduled the time with someone else. FreeBusy is pretty cool in that it does all that for you. They respond back, and we have a time figured out, and then we send out a link to meet over the Lifesize app (which is the best solution out there on the market), and we've got several third parties who would confirm that. And they can join right from their browser, which is great cause I know on my end, I get asked to participate in sales calls. I'm looking for a new product, they don't always recognize that I'm from Lifesize maybe, so they send me a fly-by-night type meeting solution that I have to download. First of all, I didn't realize I was going to have to create an account for this program just so I can meet with you. The whole time, I'm making a judgment in my head: Okay, I do not want to do business with you because you can't even get a good meeting right. There's a lot we can garner in that initial conversation that you really don't get over a telephone call — body language, nonverbal communication, etc. Sure, yeah, talking about 80% of all communication's nonverbal. The things that you can read in someone's face and their posture — all these different elements can turn into a conversation. It's not just the words coming out of my mouth. Yeah, I've seen a couple of these things. One is like if someone leans in, they're more interested in what you have to say. If they kind of lean back, they're distancing themselves. If people are kind of doing something with their feet, it's what we call happy feet. There are all kinds of little things you can pick up on in that conversation when you can actually see someone. Yeah, and you know if you've lost them. Maybe you're going over features, and one of them didn't land, you can go back and say, “Hey, this is really great because you're able to do this,” and then you kind of reestablish the benefits that you're talking through. And you know, the audio call — while it's something a lot of people use, you can’t tell if you’ve lost the person on the other line because more likely than not, they're on their on own smartphone kind of doing whatever else they do. I think we're right at the beginning of a major shift in people adopting this kind of technology and starting to just use it. You look at kids who are using FaceTime and various other free solutions to communicate with each other. They're using that as a preferred option, and I think that those folks are going to grow up and want to be in business, and they're going to need a high quality way of meeting people as well. Absolutely, so from four meetings a day, what do you say video conferencing helps you achieve today? From four, I think I could rack that up to probably six, maybe even seven, meetings. The biggest shift I found is adjusting my proposed meeting time from an hour, which I think is the default, to like 30 minutes because, in an in-person meeting, no one is ever going to meet with you for just half an hour. They're going to expect to meet for an hour. They might be a few minutes late; they might want to show you around and try to entertain you. While those might all be nice gestures, it might just be wasting valuable time that you may or may not have. We’re not visiting and everything. I'm coming to visit to tell you about what we can do, so if I can do it on video and book that for 30 minutes, in the event it runs over, I've got a little buffer because I left that buffer. I'm not booking back-to-back 30-minute meetings. I'm doing a 10:00 to 10:30, 11:00 to 11:30, so on and so forth. I find that to be really efficient because when people look at the calendar invite for 30 minutes, they feel like we have to cut right to it and compress the discussion. You can really have five, six discussions, maybe seven or eight in a day. And it gives you the ability to follow up immediately. You don't have to wait until you get a bit of WiFi at a coffee shop between meetings and all this sort of thing. That's right, that's right, absolutely. Well, I think as we wrap up, maybe you could leave us with your key thoughts on this new way of sales. Yeah, absolutely. I would just suggest that you ask yourself, How can I be more efficient? How can I be more impactful with the time that I have? Time is our most precious resource — it's finite. We only have so much of it in a day, yet we are asked to do more with that every day. Just booking more travel and more flights and hotels and spending more time traveling around isn't going accomplish that. It isn't scalable, but video conferencing is, and it’s just as good as meeting in person. Also, try to make those discussions more meaningful and impactful because no one benefits from just having time blocked when nothing is being done. So leverage the kind of technology to see whether someone's really interested in your solutions to determine whether you want spend more time discussing it. Save those business trips for when it really, really matters. You're following up with the customer who you have a great relationship with, and you know that it's not going put them out to go out to dinner with you that night. Does my product have a need in your organization? Maybe it makes sense for me to come in and help do a more in-depth onboarding. Save those on-site trips for the more important and special occasions.